Note: Interior images of water mill look better on a colour calibrated monitor. Granary from West Ashling and Lurgashall Mill Viewed from the South. 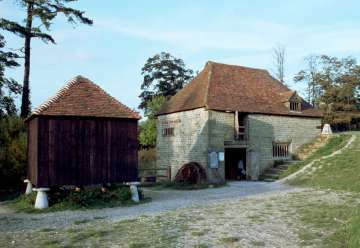 The mill probably dates from the 17th century, built of stone from the Lower Greensand, uses an overshot wheel (water fed to the top of the wheel) which is now one made of cast iron. This iron wheel came from Costers Mill at West Lavington was installed by millwright James Lee, of Midhurst. The mill's Spout (ground) floor. 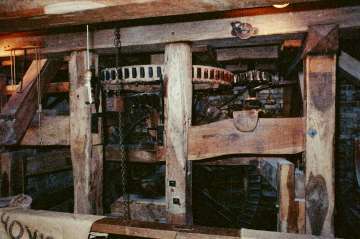 The large gear wheel (top centre) is the Great Spur Wheel and on the same shaft, the Mainshaft, below it is the Wallower. The Wallower is a bevel gear which meshes with the vertically mounted Pit Wheel bevel gear, part of which can be seen in the lower centre-right background. The Pit Wheel is mounted on the Watershaft which extends through to the outside and to which is fitted the Waterwheel. 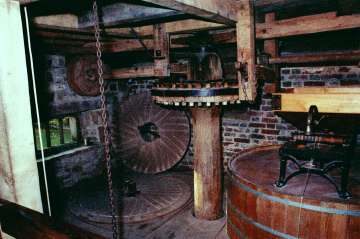 The smaller gear wheel called the Stone Nut, centre-right top, which meshes with the Great Spur Wheel is mounted on the Spindle which extends through the ceiling and the Bedstone to the drive the Runner, the upper stone. 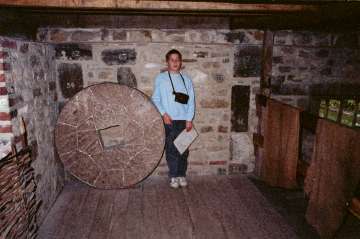 The mill's Stone (upper) floor. The Crownwheel is fixed to the Mainshaft, which can be seen comming through the floor, drives two Ancillary Drives. The one at left uses a belt drive to the top floor to operate a Hoist. The one at right drives the Flour Dresser via another belt drive. The wooden Horse, which contains the bedstone and runner, can be see lower right. On top of the Horse can be seen part of the mechanism of the Grain Hopper. A spare bedstone and a spare runner can be seen near the window. Spare stone (and son aged 13). This picture gives some idea of the diameter of the stone. The mill was (and probably still is) in 1989 used for producing flour sold in the mill and at the Museum shop.